The latest figures from the government show that farmland bird populations are continuing to decline (by a further 7% between 2011-2016). Of all the farmland species, the turtle dove has seen the most dramatic fall. Numbers of this precious summer visitor are down by 97% in the UK since 1970. While the birds face issues along their migration routes to and from Africa, their disappearance has in large part been due to a lack of suitable food on their breeding grounds. Modern farming practices have reduced the availability of wild plant seeds, the doves’ staple food, particularly at the start of the summer when the birds arrive in May after their long journey. In the UK, turtle doves rely on farmed landscapes, foraging for wild plant seeds along field margins and un-cropped areas. They feed in areas of short vegetation or bare ground with plentiful seed. Turtle doves also require accessible fresh drinking water and dense woody vegetation – typically hedges or scrub – in which to nest. In the 1960s, UK turtle doves would typically make three nesting attempts each summer. By the 1990s, with a lack of suitable food, most made only one or two. This means the doves aren’t producing enough young to sustain the population. We used recent data to identify 29 remaining stronghold areas for these beautiful and sonorous summer visitors: across Cambridgeshire, Essex, Kent, Norfolk, Suffolk and Sussex. In over half of these ‘Turtle Dove Friendly Zones’, we are working at scale with farmers and land managers to provide vital ‘food plots’ for turtle doves. This includes sowing key food plants, and allowing wild food plants to grow up. In many cases we also directly provide a carefully selected mix of seeds to provide the birds with an emergency source of food. We are also working to ensure the birds have suitable habitats for nesting and sources of drinking water. 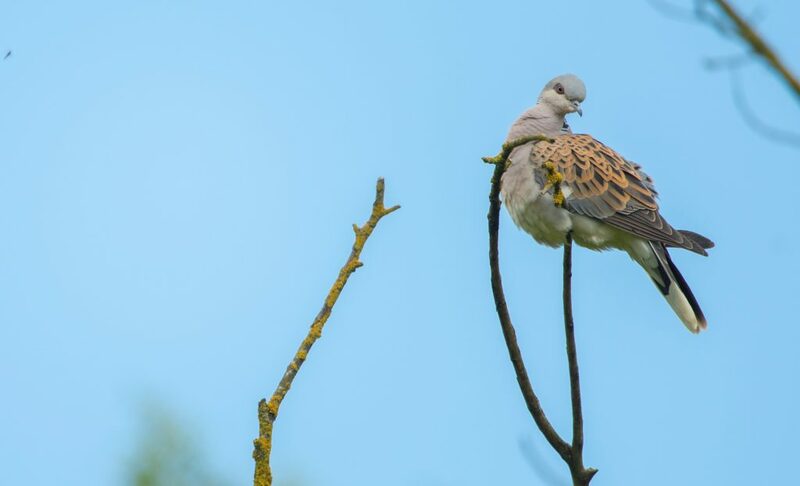 In 2018, thanks to the support of partners and generous donors and grant-givers, including The Golden Bottle Trust, the John Swire 1989 Charitable Trust, The Michael Marks Charitable Trust and The Spear Charitable Trust, we have been able to engage with over 120 land managers to provide vital habitats for turtle doves. That involves providing seed for nearly 100 supplementary feeding sites across eastern and south-eastern England. It’s early days to assess results, but from camera trap images and surveying, we already know that more than half of these supplementary seed feeding food plots were used by turtle doves this summer. These tangible results are very encouraging both for us and the land managers we are working with. We hope we can build on this success and do even more for turtle doves together as a result. Thank you to all our partners and generous funders. As one supporter, Jane Hoare, explained, when she first saw these birds “it was dove at first sight”. By working together, let’s make sure others have the joy of seeing these exquisite birds and hearing them purr over our fields for generations to come.